Lola Schock, left, and Amani Antoine, right, are going to Texas in July to represent Montana in the 2018 World’s Our Little Miss pageant. Lola Schock is excited about going to the national competition. 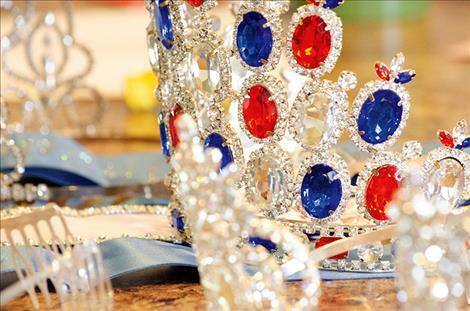 Several crowns from past wins are set out on the table. Amani Antoine gets the crown she won in the Our Little Miss Montana competition secured on her head. Two local girls in St. Ignatius are getting good at figuring out how to keep sparkly crowns on their heads. 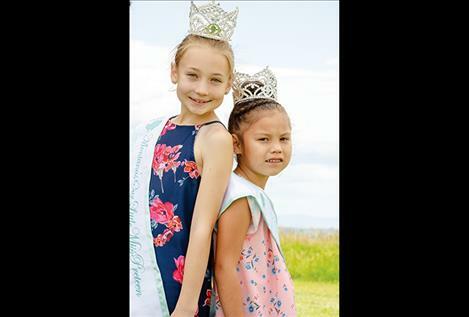 Amani Antoine, 6, and Lola Schock, 11, won titles in their age groups at the state level in the Our Little Miss Montana competition held in Great Falls earlier this year. With those wins, they are both traveling to Texas to represent Montana in the 2018 World’s Our Little Miss pageant around mid-July. The Little Miss pageant is run by the same company that puts together the Miss USA competition. “I can’t think of any other locals who have done this,” Lola’s mom, Alyssa Schock, proudly said. 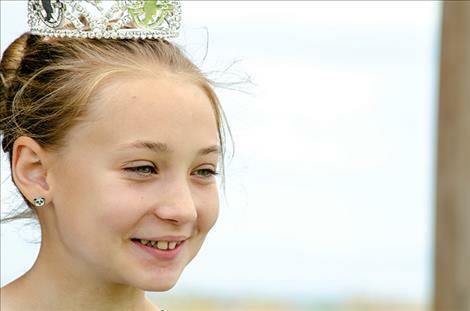 Lola said she was inspired to start competing in pageants when she was about five years old after watching her mom win the Mrs. Montana competition in 2013. In the past six years, Lola has picked up five titles including wining Miss Good Old Days twice in St. Ignatius. 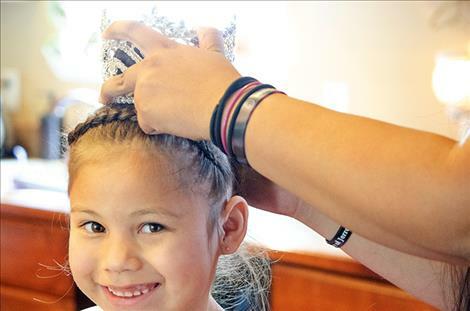 Amani decided to start competing in pageants after watching Miss Salish at a powwow, and she plans to enter that competition one day when she is old enough. Until then, she decided to practice skills like interviewing and public speaking by entering other pageants. 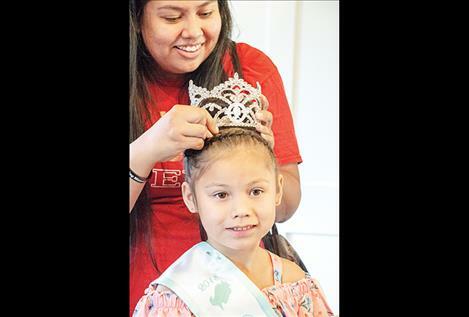 She shared her powwow dancing skills at the Montana Little Miss competition and won in the talent category. Both girls won Miss Photogenic at the Little Miss Montana competition in their age groups. Lola says competing gives her a platform to talk about things that are important to her like encouraging funding to fix the leaky roof on her school at the St. Ignatius School District. She would also like pageants to include more opportunities for boys. She said the Good Old Days pageant has a mister category, but she would like to see more done with other pageants. She also likes to go shopping and pick out the outfits for the competition, and the Texas competition is tough. Lola’s mom said the requirements for the Little Miss contest are more stringent than what was required for her adult competition. Alyssa said the Little Miss pageant isn’t like most pageants. “It’s no glitz and no makeup,” she said. To prepare for the pageant, Lola had to go to the hair salon and get the pink highlights taken out of her hair and return her locks to their natural color. Amani’s mom, Pauletta Antoine, said she has done bake sales and raffled off beaded items to raise money for the trip to Texas for her daughter to compete at the national level. If anyone wants to contribute to the project, she said they can find her on Facebook. Lola also has a Facebook page “Our Little Miss Montana Preteen 2018” where people can support her efforts. She has sold raffle tickets, T-shirts, found local sponsors, and spent time at the Mission Falls farmers market to raise funds to go to the pageant. Lola thanks the community for their support. She also thanks her dad, Ryan Schock, for donating to her project before he was deployed to Afghanistan with the military. Both girls have 12 outfits ready for the weeklong competition in Texas starting on July 15. The finals will be held on July 21. Until then, the girls will be practicing their dance routines for the talent portion of the competition and studying the rule book for the pageant with their moms.